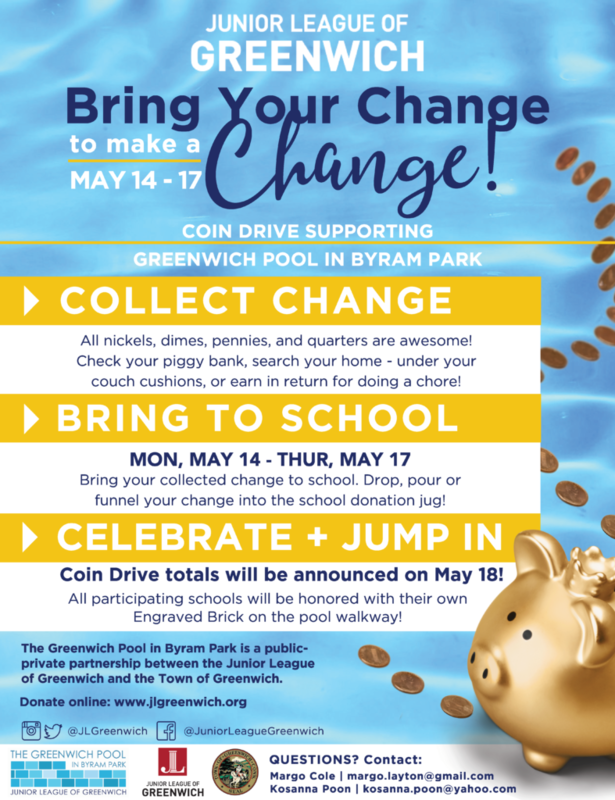 With summer just around the corner and the opening of the new Greenwich Pool in Byram Park in June, the Junior League of Greenwich is excited to announce the kick off of its “Bring Your Change to Make a Change” Coin Drive to support the new Greenwich Pool in Byram Park. 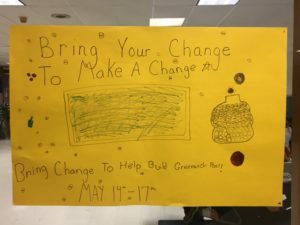 All 15 Greenwich public schools have signed on to participate in the coin drive and pool awareness campaign, taking place Monday, May 14 through Thursday, May 17. The display will feature 5-gallon water jugs generously donated by Crystal Springs bottled water company, photos and fun facts about the new pool, educational flyers and complimentary pool bookmarks. The coin drive will take place Monday through end of day Thursday and the total amount raised will be announced on Friday, May 18. For youth not attending a participating school, the Junior League of Greenwich Headquarters (231 E. Putnam Avenue, Greenwich) will be accepting coins. Youth are invited to collect their coins and bring them to the Headquarters where they can make their donation to support the pool. The Greenwich Pool in Byram Park project is a public-private partnership between the Junior League of Greenwich and the Town of Greenwich, which started in 2010 to build a new outdoor community pool and revitalize Byram Park. The project is being funded by the Town of Greenwich, the Junior League of Greenwich, foundations, corporations and generous donors. Click HERE for more information about the new community pool.